I can always spot a Schoology lover just by the way they pronounce it: “school! oh! gee!” I know I certainly have the same level of enthusiasm while sharing about Schoology! 2. Get Course Profile pictures! I teach 11 courses over the course of the year. Eleven. That’s a lot- and my students are enrolled into between 10-14 courses themselves, depending on specials. I can’t believe how many teachers still don’t put up profile pictures for their courses! As a teacher, I need all the help I can get finding my courses quickly, so having profile pictures that clearly indicate the courses and what day/period I see them makes all the difference to me! Simple, colorful course profile pictures make it easy to find courses for teachers and students! I like to suggest to students that they order their courses in the order in which they see them during the day- first period listed first, and so on- also moving courses down when they only meet for a certain time of year. As a teacher of a one-semester course, I’ll often change or delete the profile picture once the course ends so as not to confuse myself or the kids! One way to change the look of your course page is to add content on a page and choose “display inline.” This provides a little extra visual support for students especially as the year goes on and the courses start to get full of content. The same technique can be used to make folders more visually appealing and eye catching to students! Elementary teachers and teachers of ELL students will find this extremely useful! Do you have any other great Schoology hacks to make life easier? Share in the comments- I’m sure Part 2 is coming shortly! Typically, I used the lessons on Common Sense media as a starting off point. When I first took on the Info Tech class six years ago, they were a great crutch while I got my feet wet, but in reality, they’re kind of boring. And preachy. And juvenile (even the high school ones). However, there was one lesson I did kind of enjoy called the Trillion Dollar Footprint where the kids can choose who they would hire to host a TV show based on snippets of their digital identity. The kids really got into it, even if the evidence provided with the lesson was kind of weak. I eventually reached a point where I decided to put my own spin on the idea of looking at someone’s digital footprint to determine who would be best suited for the job. I called in some favors from my previous life as a college gymnastics coach and was given permission from a few of my former athletes to take a few pictures off of their social media pages to be worked and used for a class activity. The results are priceless! Would she be a good teacher? These documents can bring forth any number of activities, but the point is still the same: what is posted about you online can have a significant effect on how others perceive or judge you, and those judgement might end up getting in the way of your future goals. The conversations kids were having about the different “job candidates” were pleasantly mature and serious. I was thrilled with the points they were making about posts that portrayed the candidates in either a positive or negative light. I would love the chance to revisit this lesson before they enter high school with the mission to help them curate a positive digital footprint so that colleges and future employers will be excited to recruit them! How else do you teach Digital Footprint? I must have missed the #OneWord challenge for 2017- so looking back , I guess if I had to pick one word summarizing my year as an educator, it would have been Adventure. 2017 was a year of firsts for me- my first full year only teaching one prep, first time presenting at an EdTech conference, first time teaching in and supporting a 1:1 environment, first time reaching out to the greater educational community, first time helping to build and roll out a new online course for our students. I think “Adventure” is an appropriate way to describe the journey I’ve been on and the surprises and challenges that still manage to be present at every turn! I’ve decided to go with Positivity as my #OneWord. This will be no surprise to those who know me, but I think it’s time I make that extra effort to commit 100% to the positive vibe lifestyle. To me, positivity doesn’t just mean avoiding negativity, but looking for and celebrating the good there is. When presented with a challenge, positivity means asking myself, “What can I do about the situation to make it better for everyone?” If something is out of my control, deciding how I will make the best of the situation in spite of the obstacles. I have a 2.5 year old, and he tests my strength more than any room full of 11 year olds. We all would benefit from more positivity in our house! Finally, positivity means looking at each of my students and colleagues and trying to make my classroom a bright spot for each of them- a place where they can feel welcome, respected, and empowered to grow and take risks. So maybe this means I’ll need to add in an extra cup of coffee, maybe my students will once again think I’m crazy, maybe my husband will think I’ve gone back in time to my hyper enthusiastic cheerleader days (you can totally see it now, can’t you? ), but 2018 is going to be a great year! …We all know how that statement ends. Alright, I’m going to give you two words and see how you react. Ready? Go. If your first instinct is to cringe or start complaining, you are in the same boat as most teachers across the country. With so many teachers championing more movement in the school day (Recess! Phys Ed! Unstructured Play! The kids need to move!) you’d think most would better understand why they’ve become so popular. I must say, walking around school with a handful of spinners in my pocket made me completely understand what the fuss is about. They’re quite satisfying. Might just get one for myself. Is “pre-flecting” a word? Like something you do before you do something that would necessitate reflection? Teachers do this all the time, right? Am I losing it, or should this be a thing? As part of our district’s Digital Conversion and Blended Learning Initiative, I have been privy to many a workshop and Skype (excuse me, Zoom) session with the wonderful Marcia Kish. In addition, my connections with the #PersonalizedPD and Teach Like a Pirate (#tlap) movements on Twitter had me doing some hard thinking about why students should do any learning they aren’t interested in. I’m fortunate enough that I teach a course that is about 75% interesting on it’s own, but I often wondered how to convert that last 25% into something really engage my students into making InfoTech class personal. I’ve been intrigued by idea of Genius Hour for a few years now, but I know what happens when you make things “too” open ended for middle schoolers. Chaos. I’m totally comfortable with chaos (See: picture), but I wasn’t totally sold on how it could work in a class. In one of our Skype sessions with Marcia Kish she mentioned choice boards as an option for early finishers to keep them engaged. That, combined with this beauty I found on The SuperHERO Teacher’s TPT store and Instagram, gave me a monster of an idea. Instead of opening up the Wild Wild West of “Computer Lab Free Time” in the lab, I dreamed up 12 different activities that students could really become engaged in as they finished their other class work. My dream is that everyone would complete at least one “project” that would inspire them in some way. Each of these “projects” give a touch of guidance but are still open- ended enough that they could be applied to any variety of interests. I’m temporarily calling this “Choice Time.” (The name needs a little work still!) I have begun introducing this to my classes, and I’m encouraged by what they are starting to think of! 4.If it’s not working for you- start something new! 5.There’s no prize for doing the most or the least- so work for the prize of your pride! I posted all of the activities in our Schoology Course as well as on the wall in my classroom. Choice wall ready to go! I built assignments in Schoology where students could submit “artifacts” of their choosing, and it’s my hope that I will build a blog/website to highlight some of these as they start to come in! I’m excited about the buzz I’m hearing from the kids and others- and I hope to bring you a positive update in a few weeks! Like any new idea, it’s going to take a lot of tweaking and putting procedures in place before I’d consider myself any sort of expert! Has anyone done any sort of Genius Hour/Choice time in their classes? Does anyone have any advice for me? Warning- this has nothing to do with technology. If you’re a fellow Middle School teacher like me, you might not have the opportunity to go to graduation in your district. And why would you? The kids might not remember you, you only had them for 50 minutes a day, you were with them at probably some of their worst years- heck you won’t even recognize them. A colleague and I started a tradition of going to our high schools’ graduation as our official wrap up to the school year. There’s not many that go from the middle school- lots from the elementary schools! I love seeing them clutching framed class pictures with tears in their eyes like proud mamas. “Look at how little they were!” they’d tell me. This year was very special to me. I remembered this class as a crew that I genuinely enjoyed, but that challenged me a lot. One boy that particularly challenged me as an eighth grader came back to visit me a few weeks ago. He was notorius for typical eighth grade boy shenanigans that actually led me to officially forget who else was in that class as they graduated. When I saw him Friday in his cap and gown he said to me, “You made it!” My eyes filled with tears as I thought, “No, YOU made it!” I insisted on this selfie so that I have a daily reminder that when faced with a difficult student, continue to try to connect with them and never lower your expectations. It will be worth it. Another defining moment came during a musical performance by two more of my former students. These two always were very musically inclined and they used to sing ALL. THE. TIME. in school. So much that there were days that I would groan, “Will they EVER just shut up? !” Watching them so in their element, the passion radiating from each of them in that moment, rocked me to the core. Who was I to ever suggest that they squash that one piece of themselves that made their souls literally sing? How often do we run into situations when our students have a passion and we force them to shut that piece of themselves off to fit our mold and expectation of being “educated” in our content? How could I have incorporated that passion of theirs (or anyone else’s for that matter) more into my course to excite them and further grow them as future musical heroes? The terms “genius hour” and “passion projects” are big buzzwords in education these days, and it doesn’t take a degree in education to know that allowing students to pursue what they love is a great way to engage them in the educational process. So why do we insist that kids put that piece of their heart away so we can stuff them in rows and pump information in them that really, doesn’t matter to them at this point? And we all wanted to ban the stuff. Long story short, if I couldn’t do this job, I don’t know what I’d ever do with myself. I’m fully refreshed and ready for September. Who’s with me? To the Class of 2017- thank you for teaching me more than I likely taught you. I learned about patience, humor, passion and compassion. Go on and do great things because I know you have it in you! I get asked versions of this question all the time. (I should preface by saying I’m a PC girl right now using MS Office (but not that 365 nusiness, because I need the features, yes?). I know there’s Mac equivalents of all of this you can look up, and if you’re Team Chromebook, I’m sorry. 1. Snipping Tool (insert chorus of angels)– OMG. I still can’t believe I had to learn about this from my dad. If you have yet to experience the magic, the Snipping Tool is hidden in the “Windows Accessories” and allows you to take a screenshot of a specific area of your screen. From there, you can choose to save the image, copy-paste it to another program, or attach it right into an email. It’s like why even bother having PrintScreen as an option anymore? 2. Clone (Ctrl + D)– Have you ever been working and thought- why doesn’t someone invent a way to copy and paste in the same command? Well they DID. And apparently it’s been around forever. In an earlier post I mentioned my love/hate relationship with SMART Notebook. One tool that I was totally into was located under Cut/Copy/Paste; there was also an option to CLONE. Say wha? So say you pefectly format a text box but you need 10 of them on a page. You COULD copy/paste it 10 times, or you could clone it. When I right clicked on it in Notebook it said that the shortcut for Clone is Ctrl + D. Does it work in Office? YES IT DOES. CTRL + D for everything!! -One of my favorite ways to teach this to the kids is in PowerPoint around the holidays we manipulate some pre-made holiday scenes. We put in one piece of clipart of a present and then with a few key strokes multiply it to ALL the presents! What could be better?! 3. Save/Print as PDF- It’s become universally accepted that if you plan on sending or sharing a document, it should be a PDF. Luckily, there’s two quick and easy ways to make that happen. One is by “printing” anything (website, Word Doc, PowerPoint), and in the drop-down menu for printers, “Adobe PDF” is usually listed as an option. I love this because I still can have my original version to update and change as I go, but I also have a “final” version to distribute and share. Word Docs just don’t look the same on every computer. Another way to create a PDF is by choosing “Save As,” and in the drop-down menu for “file type,” PDF should be listed as an option. This tool is clutch especially if you’re a font junkie like me! 4. Export a PowerPoint to a Movie- yes, this is a thing. And it has been for awhile too apparently. Again like everything, there’s two ways to do it (Bill Gates, you are a crafty one). The basic way is under the “File” tab, choose “Export” and “Create a Video.” (I know in older versions, the language was a little different- “Save and Share” comes to mind- so you’d have to check). The export will put the slides at 5 seconds apiece unless you’ve rehearsed them to go longer or there’s more than 5 seconds worth of animations or activity. 5. “Open Link in New Tab”– So simple, yet so essnetial to productivity. Right clicking on any linked item will bring this up as an option (usually the first one). This is insanely helpful if I’m on a power TPT shopping trip or am comparing a few different items. From there, the open tabs kind of function like a to-do list. Every tab I close brings me one step closer to that magic moment when I can walk away from my desk! I hope that maybe at least one of these was something new to you or you are walking away with a new idea of ways you can use the tools that are right in front of us! 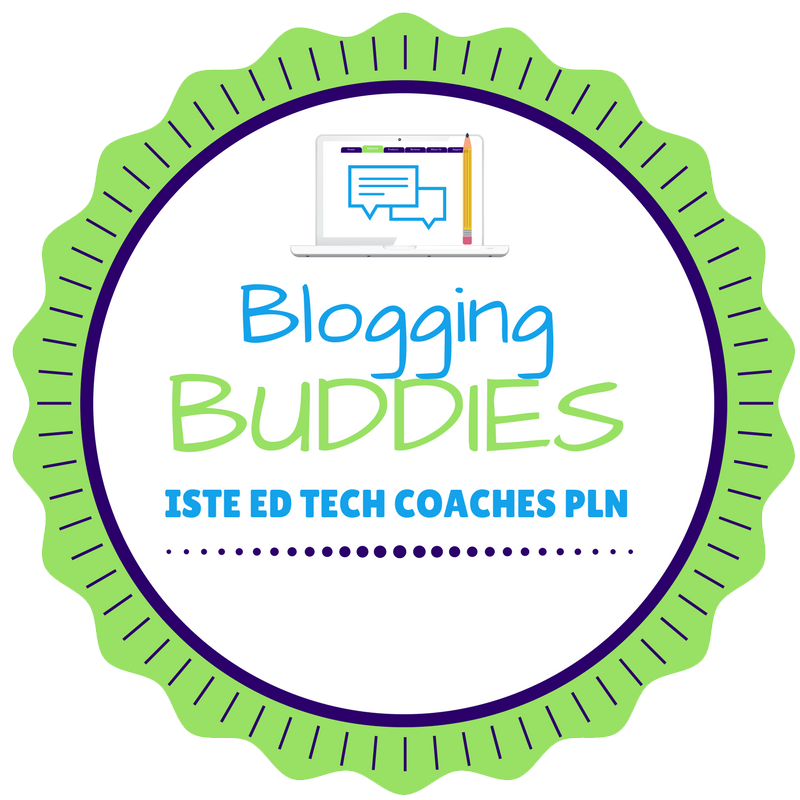 I'm a member of ISTE's EdTech Coaches' PLN- "Blogging Buddies"! 🚨🚨this is a must read! #Repost @tech_missc ・・・ I want to talk about about the labs we use and the impact this has on the iGeneration or Gen Z also referred to as Digital Natives. There is definitely this idea that the iGeneration who have simply been born into a generation of technology at their fingertips and given the technology from an early age rather than being taught or shown how to use it or even what you can do with it. This generation are commonly given tablets / phones from the age of 2 if not earlier however just by having used technology from this age doesn’t make some suddenly digital natives or techsperts! From what I see on a daily basis it is the opposite. Most children will come to school being able to find an app or watch a YouTube video or play a game but nothing more! Ask these children to show you where the camera is and they will simply find the app or point to the screen I’ve even seen some point to the Apple logo on the back. If we continue to label children as digital natives or the iGeneration we instantly think that these students will know how to use the technology and what to do. However everyday I’m more surprised by the lack of technological knowledge that children have. Common things like checking if there is wifi, knowing how to change the keyboard, closing an app, typing a note, setting a timer as a reminder, or simply being able to ask when some thing doesn’t work. We need to support this iGeneration in becoming Digitally AWARE and more KNOWLEDGEABLE about TECHNOLOGY. I want all children to be ACTIVE USERS of technology where they create and manipulate technology rather than simply PASSIVE USERS who use technology to simply watch videos. The iGeneration are growing up with internet that is always on, technology that is there all the time, social media that they can’t escape from and an online footprint that they can’t begin to imagine. The online world for these children is exciting and the reality of social media is not easily understood by them - fame and fortune seems picture perfect but is a false story of someone’s life online. We as adults, teachers and parents need to consider what we post and the message this sends! True story! Some of these are great! Can anyone guess why I watched Fortnite dances to prepare for an IT lesson next week? Teams getting their learn on! Rothopoly kicked off today! Thank you Rachel C for today’s #digcitmeme. Saving this for next September!